Growing up in an Italian household in South Philadelphia there was always panettone on the kitchen table at Christmas time. The traditional Italian dome topped sweet bread came studded with candied citron, soaked raisins and even chocolate, depending on who made it. Part cake and part bread the panetonne is slightly sweet and buttery tasting and everything you could want on your table during the holiday season. Since moving to Phoenix we have resorted to the standard box version of panettone; which although good it is not how I remember it. Every year I have intentions of making my own, but somehow this seems to never pan out. This year I was determined; so I scoured the internet and put together a recipe from a few of the versions I found. Though making panettone is time consuming, it's not hard. And you'll realize the effort is well worth it when you take your first bite. To make the sponge, in a medium bowl, dissolve the yeast in the warm water. Add the flour and stir with a spoon or your fingers to make a loose, almost liquid, dough. Cover the bowl with plastic wrap and let rise in a warm place for at least 6 hours, or overnight. In a small bowl, combine the raisins and brandy, and let marinate for at least 4 hours, or overnight. In a large bowl, mix the butter, eggs, yolks, sugar, warm water and vanilla together until combined. Drain the marinated raisins in a small strainer set over a bowl and press on the raisins with a spoon to extract as much liquid as possible. Set the raisins aside and add the liquid to the egg mixture. Add the sponge and mix well with your hands. Add the flour a little at a time, mixing with your hands until a ball of dough forms. Turn the dough out onto a floured work surface and knead for 5 to 10 minutes, or until smooth and elastic, adding additional flour as needed. Butter a large bowl, place the dough in the bowl, and turn to coat. Cover with a clean towel and let rise for 6 hours in a warm place. Butter and flour a panettone mold at least 6½ inches tall and 7 to 8 inches wide. Punch down the dough and turn it out onto a floured surface. Flatten the dough out with your hands and sprinkle on the zest. In a small bowl, mix the raisins with 1 tablespoon flour until coated, and sprinkle the mixture over the dough. Fold the dough in half, press the edges together, and knead to distribute the fruits. Continue to knead for 5 to 10 minutes or until the dough is smooth, adding additional flour if necessary. Place the dough in the mold, cover with a clean cloth, and let rise for 35 minutes in a warm place. Preheat the oven to 400ºF. Cut an X in the top of the bread. Bake for 5 minutes, reduce the heat to 375ºF, and bake for 10 minutes. Reduce the heat to 350ºF, and bake for 30 to 35 minutes longer, rotating half way. If the top begins to brown too much, cover the bread loosely with a piece of foil. Cool the bread on a rack for about 30 minutes before serving. This is so gorgeous and I love Panettone for the holidays. We made french toast with it before too and it is amazing!! I love Panettone, but never thought to make my own - this is beautiful and so impressive! Such a classic bread for the holidays! This is just screaming Christmas! Absolutely love this and I would love to give this recipe a try! Panettone has been on my to-make list FOREVER - this looks beautiful :). My husband works for an Italian company and every year for Christmas they give panettone as gifts to their employees. I know how time consuming they are to make, and I appreciate you sharing the recipe. I really need to try making one some year down the road. I absolutely love panettone but never had homemade before! YUM! I would have never thought to make my own - this is on the list for the holidays! Theresa where would I go to get the paper mold? I got them on Amazon. it is easier than it looks to make! You should try it. 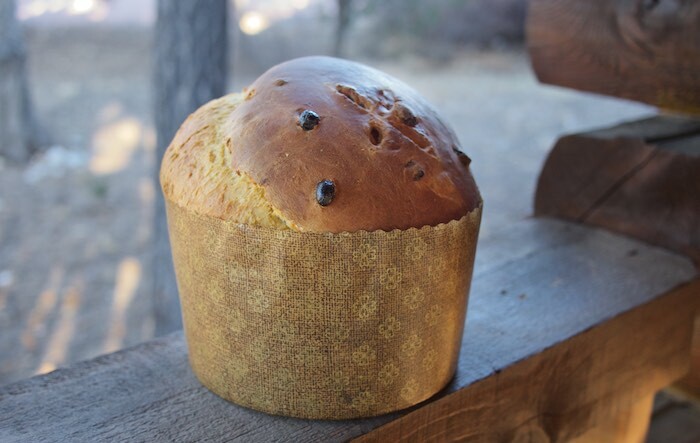 I have never made my own panettone but it looks like it would turn out delicious! This is such a lovely Christmas bread. I have never had a panettone, but it sure looks beautiful. I will have to see if I can figure out a gluten free one someday.